Steven Horsford is a Democratic member of the United States House of Representatives, representing the 4th district of Nevada. He returned to Congress in 2018, after losing in 2014. 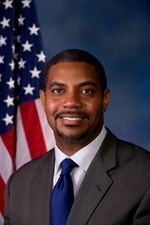 Steven Horsford, born and raised in Las Vegas, was elected to the United States Congress on November 6th, 2012, as Nevada's representative for its newly created Fourth Congressional District. Horsford is the first person to hold this House seat and the first African-American to serve in Nevada's federal delegation. Before running for office, Steven served as the head of the Culinary Academy of Las Vegas. As the CEO of Nevada's largest labor-management partnership, he worked with local unions and Nevada hotels like MGM Resorts, Wynn Las Vegas, and Caesars Entertainment to train thousands of unemployed or underemployed Nevadans for work in the hospitality industry. To this day, the Academy continues to place 80 percent of their graduates with good-paying jobs. Under Steven's leadership, the Culinary Academy also became the caterer of record for the world-renowned Smith Center for the Performing Arts and the Springs Preserve, a cultural and sustainability attraction in southern Nevada. In 2004, Horsford was elected to the Nevada State Senate, and in 2008, he became Nevada's youngest and first African-American State Senate Majority Leader. During his tenure in Carson City, Horsford passed renewable energy legislation that positioned Nevada to become a leader in the green economy, prevented widespread teacher layoffs by negotiating a budget compromise that preserved funding for public schools, and worked across the aisle to pass bipartisan legislation that provided small businesses with tax relief and new companies incentives to relocate to Nevada. In the Nevada Legislature, Steven Horsford served as chair of the Senate Committee on Finance and was a member of the Senate Committee on Health and Education and the Senate Committee on Government Affairs, among others. The Alliance for Retired Americans Political Action Fund endorsed Steven Horsford in 2014, also 2012. While Horsford’s legislative work has not touched on foreign affairs, he has progressive views on national security issues. Horsford supports the vision of a nuclear weapons free world articulated by President Obama as well former Secretaries of State Henry Kissinger and George Schultz, former Senator Sam Nunn and former Secretary of Defense William Perry. He supports programs that secure loose nuclear materials vulnerable to terrorist threat, as well as negotiated solutions to the standoffs over North Korean and Iranian nuclear ambitions. In 2018 Steven Horsford was endorsed by Council for a Livable World. From PowerPAC+, June 11, 2014. Steven and Lucy have already demonstrated their commitment to our core values at PowerPac+: issues like education, economic equality, and immigration. Last night’s victory for this dynamic duo confirms the power of the growing core of Latino voters that are increasingly driving political progress in Nevada. Below, we break down just a few of the ways Lucy and Steven are changing the game in their home state, and why it matters for all of us. Join us in supporting these two Nevada powerhouses on their way to victory in November! The change they embody could become a defining model of inclusive, multiracial politics in the Southwest and beyond. PowerPAC+ 2014 "Social justice Champions" - Marc Veasey, Hector Balderas, Pete Aguilar, Steven Horsford, Pete Gallego. By March 2013, Horsford had joined the Congressional Progressive Caucus.. Shortly after the 2018 election Steven Horsford re-joined the Congressional Progressive Caucus. 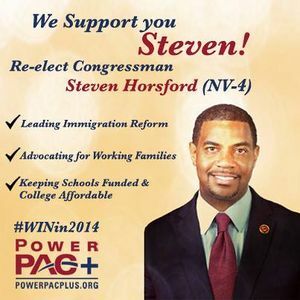 In 2018 Congressional Progressive Caucus PAC (CPC PAC), the political arm of the 76-member Congressional Progressive Caucus, endorsed Steven Horsford (NV-04) for the House of Representatives. Steven Horsford has named Asha Jones as his Chief of Staff and Jason Rodriguezas his Deputy Chief of Staff. This page was last modified on 19 April 2019, at 19:47.